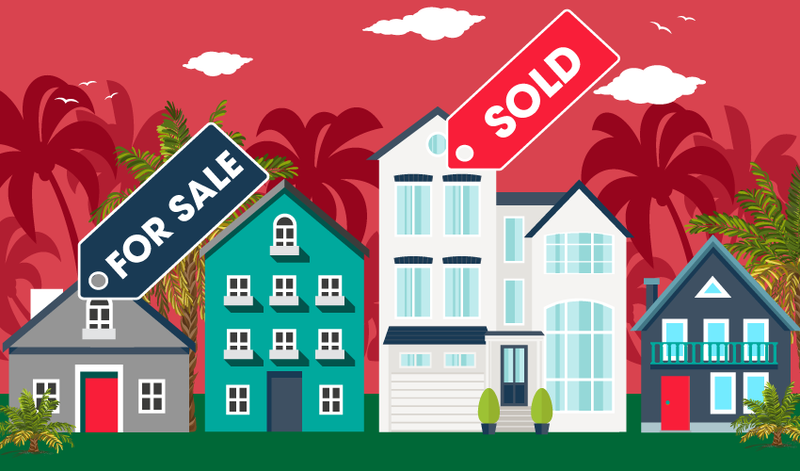 26,100 new and resale home transactions closed escrow in California during February 2019. February’s dismal sales numbers follow January’s bottom, which saw the lowest month for sales in the state since 2008, when the country was in the midst of the Great Recession. The number of homes sold was 7% lower than a year earlier, amounting to 2,100 fewer sales in the single month of February. This continues the trend of falling year-over-year sales volume, which began in the second half of 2018. 2018 ended with 442,000 home sales in California. This was 19,900 fewer sales than took place in 2017, amounting to a decrease of 4.3%. For perspective, 2018’s 442,000 homes sales volume was 41% below peak sales volume experienced in 2005. 2019 year-to-date home sales are 11% below 2018 as of February 2019. Home sales will continue to decrease in 2019, slowing the flow of agent fees. Rapidly rising prices and interest rates in 2018, along with uncertainty brought on by shifting economic policies, have discouraged potential homebuyers and derailed sales. Therefore, home sales volume won’t rise significantly until after home prices bottom with the next recession, expected in 2020-2021. Updated April 4, 2019. Original copy posted March 2009. The above chart tracks the home sales volume of single family residences (SFRs) on a month-to-month basis. Sales volume includes the sale of all residential resales and new homes in California, including new homes sold directly by builders. It’s normal for home sales volume to rise in the first half of the year and fall after June, generally speaking. Chart 2 shows average home sales as experienced from 2011-2018. As depicted, the most homes are regularly sold each year in June. Another small increase takes place in December, as homebuyers seek to wrap up their financial activities before the end of the year. Therefore, real estate professionals are not to worry when they hear of falling sales volume in the latter half of the year. This is a normal seasonal progression. What to watch for is year-over sales comparing a month or other period (such as year-to-date) this year with the same month or period last year. Annual real estate sales numbers since the Great Recession of 2008 suggest the upcoming years through 2017 will be characterized by the same continuing bumpy plateau in home sales volume we have experienced now for eight stagnating years. As a rule, current market action, whether up or down, is reflected first in sales volume, followed by prices, and both fluctuate from month to month mostly going in opposite directions or just standing still. 2014 saw home sales volume decrease throughout the year, ending the year 7% below 2013. 2018 saw sales volume decrease rapidly in the fourth quarter, ending the year 4% below 2017. 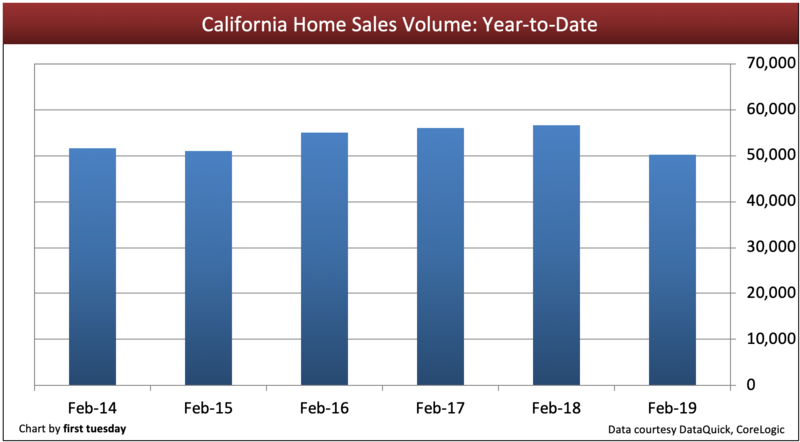 California home sales started off 2019 with a whimper, 11% lower year-to-date as of February. This continues a consistent decline in year-over-year sales volume that began in mid-2018. Sales volume ended 2018 4.3% below 2017, amounting to 19,900 fewer sales. In contrast, 2017 home sales volume ended the year with just 3,800 more sales than in 2016. This is an increase of less than 1%. The previous year, 2016, also saw a minuscule increase over 2015.
static turnover in rental occupancies. Much of these disadvantages are due to the jobs recovery which has been dragged out for eight years now, a confidence issue, and is pronounced by wage increases below the rate of consumer inflation. California finally regained all jobs lost in the 2008 recession in mid-2014, but has yet to return to pre-recession employment levels after considering the 1.1 million working-aged population increase. At the current recovery pace this will occur in 2019. Short sales, real estate owned (REO) property resales and speculators have contributed to sales volume distortion over the past few years. Conventional positive-equity resales by owner-occupants were the exception, sometimes reminiscently called standard sales as opposed to short sales. As prices rise, move-up homeowners will return to the market to sell and concurrently buy a more suitable replacement home. Further, as of Q3 2017, 3.2% of California mortgaged homeowners were still underwater. Thus, turnover by this chunk of owners is restricted. These homeowners cannot sell and relocate to purchase another home because their homes are worth less than the debt encumbering them. To rid themselves of the home and the debt, they have to endure damaged credit resulting from a short sale or foreclosure. The desire to avoid this embarrassment takes most of these 3.2% homeowners out of the home buying market for years. 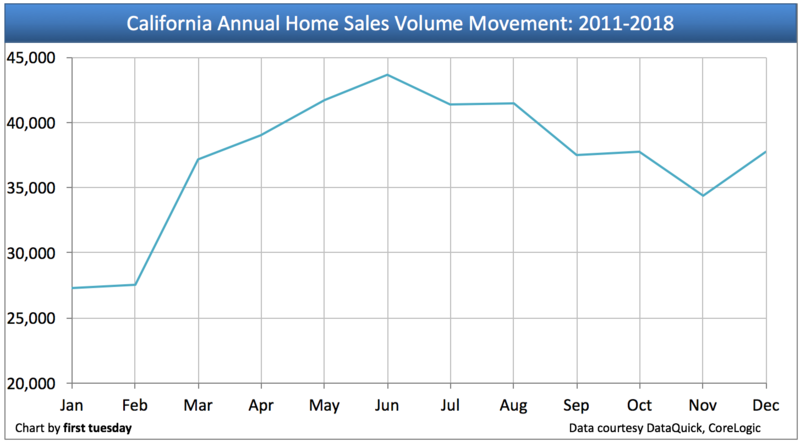 The forward trend in California home sales is mixed for both buyers and seller. Homebuyer income is going further and doing more than anytime during the past 15 years due to increased borrowing capacity brought on by low interest rates (even though they rose mid-2013 to cut back funding by 10% from one year prior, but dropped to fuel sales in 2015). In fact, the Buyer Purchasing Power Index (BPPI) went negative in June 2013 and bounced back to zero in September 2014 – this momentarily stalled home price expectations. In December 2015, the Federal Reserve (the Fed) committed itself to raise short-term interest rates in order to keep a lid on the recovery (as they did in both 1984 and 1994 midway through those recoveries). This upward rate move by the Fed (and the bond market) will instantly be reflected in ARM rates, and eventually trickle into higher mortgage rates, likely around mid-2016. Higher FRM rates will promptly trend real estate sales volume down and some 9-12 months beyond prices will slip. As prices start to decrease, expect the short-term rate to decline in the 2017-2018 period which will slow and put an end any downward turn in real estate sales volume and the economy. first tuesday forecasts home sales volume will return to 2006 levels around 2020-2021. The peak sales volume last seen in 2004, inflated by speculator acquisitions and excessive mortgage money, is unlikely to return for decades, when interest rates cyclically peak. Relocating Baby Boomers going into retirement later this decade will be the primary propelling force in both selling homes and buying replacements beginning around 2019. Their Generation Y (Gen Y) children will add to the sales volume at the same time as they find jobs at better pay levels and become first-time homebuyers. Gen Y influence will peak in sales volume at the end of this decade as they complete their shift from renting to owning. Once Californians feel the effects of two or three years of healthy employment growth, their confidence about the future will improve. They will once again be willing to invest in the economy since the expectations for tomorrow are projections based on yesterday’s most recent experience. Only then will occupying homebuyers – end users – return in sufficient numbers for sales volume to swell significantly. In 2018, sales volume will begin to pick up in earnest, peaking in 2019-2021. Employment and labor force participation will have reached beyond its 2007 peak, and grow quickly. Then, California will once again see home prices jump beyond the rate of consumer inflation. Mortgage lenders with an eye for excess profits will then begin to loosen their lending standards to whatever extent federal regulators permit or lawyers divine. The memory of the grim mid-2000s will be politely pushed aside, and mistakes will be repeated by all participants – lenders, builders, brokers and buyers. the recapitalization of the private mortgage insurers to eventually replace (or fully compete with) government guarantees of home mortgages. tightened loan standards as lenders are forced to apply forgotten fundamentals of sound mortgage lending practices (20% down payment on non-FHA/private mortgage insured loans, lower income ratios, risk-free credit scores and full documentation of income, funds and collateral value). What’s a broker to do until home sales volume takes off? SFR brokers and agents might consider adding SFR-related services to supplement their income. Those who do add related services will restructure their practice as “all-service brokers.” Transaction-related services will be integrated into their office operations to maintain solvency and grow. using barter credits in lieu of greenbacks, etc. Prudent brokers will insist their prospective buyers commit to exclusive representations by the broker and agent to locate a home (or other property). By signing an exclusive right-to-buy listing agreement, buyers commit to employ brokers and agents just as sellers commit to employ brokers and agents, the obverse side of the same employment coin. This will ensure time spent with a buyer produces a closing and a fee. 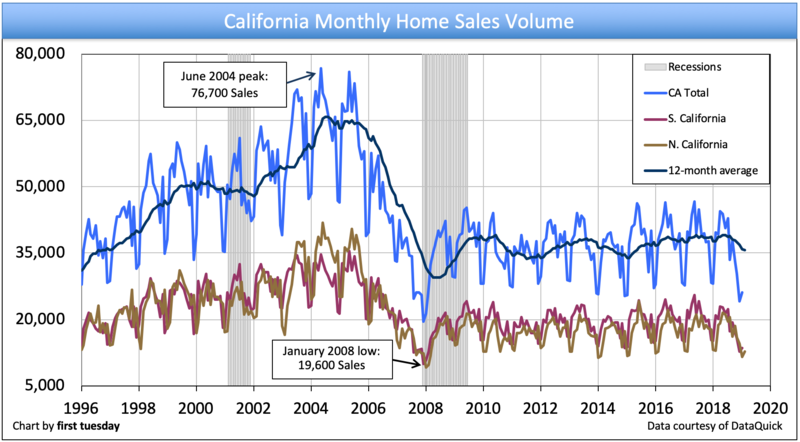 The trend in California home sales during the initial years of the 2010s remains grim for sellers. Not so for buyers. Homebuyers’ dollars are going further than anytime during the past 15 years. Sales now and into 2014 will remain excessively lender-driven and speculator-riddled, but will be easily predictable for SFR agents and their brokers. The center of this action is the multiple listing service (MLS). 2012 saw sales volume and home prices increase marginally, supported primarily by massive speculation. Budging from sticky pricing (or not). Real estate owned property (REO) resales and speculators have contributed to sales volume oddities over the past few years. Conventional positive equity sales remain the exception. Lenders have turned increasingly to short sales in 2012, surpassing the number of foreclosures in California. Short sales will continue to make up roughly one-fourth of the home resale market in 2013. Going into 2013, sales volume is gradually recovering as speculators begin to exit the market, making room for buyer-occupants. Sales volume will likely increase by 10% in 2013, due to slowly improving confidence and job numbers. Anticipate modest price increases to follow in 2014, falling back in 2016. In 2015, the Federal Reserve (the Fed) will need to raise short-term interest rates in order to keep a lid on the recovery (as they did in both 1984 and 1994). Expect the short-term rate to decline within one year, the 2016 period, at the end of a downward turn in real estate sales volume. Sales volume’s next big peak will occur in 2019-2020, with pricing following 12 months later. The real estate market is now settling into a long recovery. For home sales volume to achieve the kind of dramatic but stable recovery which took place in the 1996 period following the 1990s real estate recession, employment will need to increase at the rates experienced in the mid-1990s: 350,000+ additional jobs created annually for three years. California’s labor force is inching back to that number, as a total of 700,400 jobs have been gained since employment was at its lowest in January 2010. However, as of October 2012, California is still 900,000 jobs short of the employment level before the Great Recession. Once Californians feel the effects of two or three years of healthy employment growth, their confidence about the future will improve. They will once again be willing to invest in the economy. Only then will end users return in sufficient numbers for sales volume to swell. In 2017, sales volume will begin to pick up significantly, peaking in 2019-2020. Employment will have reached its 2007 peak, and will continue to grow quickly. 2017 will see home prices jump well beyond the rate of consumer inflation.Mortgage lenders with an eye for profits will then begin to loosen their lending standards to whatever extent federal regulators permit. The memory of the grim mid-2000s will be quickly pushed aside, and mistakes will be repeated. the recapitalization of the private mortgage insurers to eventually replace government guarantees of home mortgages. tightened loan standards as lenders are forced to apply the forgotten fundamentals of sound mortgage lending practices (20% down payment on all non-FHA loans, lower income ratios, risk-free credit scores and full documentation of income and funds). SFR brokers and agents can consider adding SFR-related services to supplement their income. Those that do add related services will restructure their practice as all-service brokers. Transaction-related services will be integrated into their office operations to remain solvent and grow. Brokers can also insist that prospective buyers commit to exclusive representations by a broker and agent to locate a home (or other property). By signing an exclusive right-to-buy listing agreement, buyers are asked to employ brokers and agents just as sellers are asked to employ listing agents. This will ensure time spent with a buyer produces a closing and a fee. NextPOLL: How will deporting undocumented immigrants affect California’s housing market? 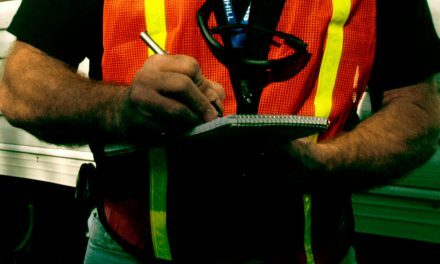 Do a city’s annual rental inspections violate tenants’ rights to privacy or state law? January 2008 was not in the midst of a great recession. The recession didn’t start until fall of 2009.
informative. Your site is extremely helpful. Thank you for sharing! Great Article, it is great to know what the statistical data says but statistics are interpreted in multiple ways. Owning a home is an individual choice in response to individual circumstances and needs so sales continue regardless of what the market is doing. If people were willing to once pay rates upwards of 10% to own a home, they’ll continue to do so, especially now with rates still under the highest average rate of 6.19% according to another “statistic”, rents continue to rise, most new construction are apartments and live/work developments where everyone it’s crowded living, people want their own piece of America. Many people are also taking advantage of higher loan limits in high cost areas $679,650 and Down Payment Assistance Programs that cover the down payment and closing costs up to that amount, without having to be a first time buyer!! Is there a difference between Northern and Southern California markets concerning vulnerability? I have been under the impression that if the economy dips, SoCal prices drop sooner and faster than NorCal prices because there is more supply down there. Isn’t that what happened in the early 90s? And is the desert more vulnerable than the rest of SoCal? I ask because we are hoping that our home in the Sacramento-Tahoe region will hold its value and that the desert prices will drop first so we can retire to Palm Springs with an advantage. We would like this to happen in about 5-8 years from now. There was a decline, starting in 2008, along the I-5 corridor of the Central Valley, as environmental issues effected home sales. The shut down of the Harvey O. Banks Pumping Plant, which delivered water for 400 miles of homes and farmland created housing market chaos as over 50 towns lost water for showers and toilets, businesses, hospitals, schools and prisons. Unemployment increased to 40%. (Search online , Dead Harvest, Devin Nunes for details) Valley Farm prices and land values predictably dropped, as water prices increased to $2000 per acre foot. Dust bowl conditions and migration out of the valley continued as the Federal government, faced with litigation, turned the problem over to the State. Major cities found lower cost housing prices rising due to an influx of displaced agricultural workers and industries. As the state’s tax base eroded, necessary college tuition increases created more interest in low cost rental properties in campus cities. Shortages of low cost rental property and homes, including trailer parks developed as an influx of new immigrants pushed moderate cost homes to continue raising in value in the major cities. Wild fires, made possible by laws controlling the clearing of underbrush, effected populations along the mountain ranges and in the northern portions of the state. Displaced home owners were greeted with a housing shortage and increased prices. Drug cartels attempting to control marijuana farms also contributed to the fire danger. The northern portions of the state, were affected by mandated water control issues, while, at the same time, dams and reservoirs were removed to limit hydroelectric production and promote the state’s goal of windmills and solar panels sales. The mandated requirement for homes to buy into solar panels prior to resales, pushed prices up. 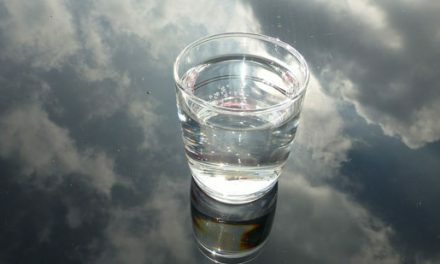 Laws requiring state wide rationing of drinking water in less than 2 years will have a predictable impact. The newly mandated water divisions, recently mapped by Sacramento, with ability to add unlimited taxes on properties, within these divisions, should impact home sales between L.A. and San Francisco along the coastal valley and Salinas River. The scheduled removal of the Diablo Power Plant which serves much of California is predicted to have a heavy impact especially in SLO County. Statistics can be interpreted in many ways but it’s important to at least start with hard data and not just opinion. Just another bubble, worse than the others – and I’ve witnessed quite a few. When THIS one goes, it will be ugly. Based on what? The real estate market is much stronger and more stable compared to 2006-2007. Based on what you just said. I’m sure you asked and said the same thing back in 2006-2007, that you think the real estate market was much stronger and more stable compared to the previous recession. 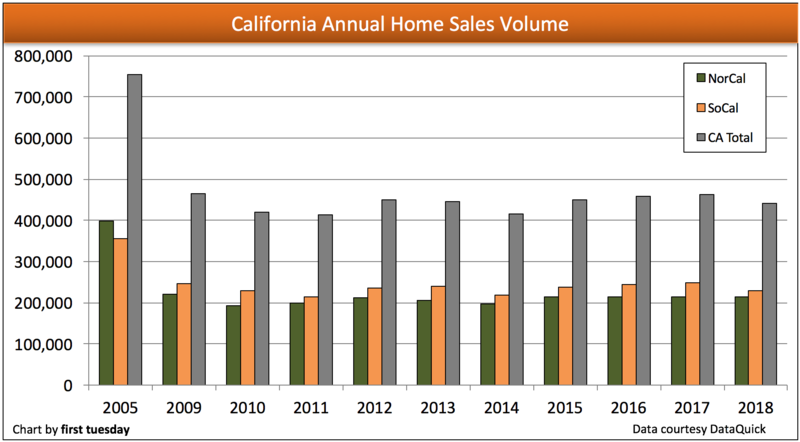 Thank you ft Journal for the California home sales volume statistics. I know you’re right. Why are the prices really so high? Greedy Realtor-Builder-Banker Industrial Mobsters colluding and enslaving the nation. REALTORS are the only culprits that property prices are going up, because we try to give the seller the highest gain ever. Why not stop and standardize prices? Home buyers keep earning almost the same as 10 years ago. So it’s happening with HOA’s collections now. How much will they pay in 20 more years? The value of the houses are becoming unreachable for the community. So expensive that there will be a terrible number of homes for sale without a chance of being sold. Is there another big drop in the Real Estates market? Hey Wokka i am trying to buy a house and i am already pre- approved but would it be smart to wait and see where the housing market goes?? Or you think is a good time to buy right now?? If you’re pre-approved, and you have a great rate locked in, I wouldn’t throw it away by waiting to see what happens with the market. Rates are going to rise, and when they do, you could end up qualifying for less than you are approved for now, if the rates go high enough. You need to make a decision: If you think the housing market will keep going up for a little longer yet, then now would be a good time to buy, since it’ll be more expensive later. If you think a correction or even a crash is coming relatively soon, then waiting may be a good idea, but you will most likely get a much higher rate than you are approved for now, but you’ll be able to buy the same home, or better, with lower property values in play. There’s no guarantee about which way the market will go in the near future. If you want someone’s opinion, buy the house now if you can afford it. Without taking into account that HOA have been increasing year by year. Is there a California government office that will review HOA high fees? … Currently it is so expensive to buy a condomminium that payments are as high as buying a home. Where will the poor people who live the heaviest and least paid jobs live? Think about the next 20 years. Who can live in California and pay a mortgage without eating? Great analysis. Right on. Most Bay area homes are really old and in case of any type of natural disasters, the cost of rebuilding is exorbitant. Housing market in the Bay area is good for flippers, tech-rich investors and those who can sell it to other fools at the peak value. Thank you for telling the truth. Really! I see whats going on myself. Don’t know if i should buy now. I completely agree with your comment. I’m 34 yrs old and have been studying the trends of housing and how the economics of the Bay Area are. I feel like their is a bubble about to explode. ( I call it the last hooraahh for the baby boomers to screw their kids). Really? It’s called the free market for a reason. If people are willing to pay such high prices, then that’s the valuation. I have a Masters degree too, but way more market/business experience so I’m sorry but I don’t agree with you. I am looking into purchasing my first home. My husband and I make about $130k a year combined and we are tired of paying over $2k a month on rent. We live in the Bay Area. We are a family of 4 plus my mother would move in with us and would financially contribute. Is it a good time to buy? Because people keep convincing me otherwise. Alex, If you are confident you can stay in the home for at least 10 years, it will be a good decision for you… even if we are at a peak and we have another decline. Rents always go up. Houses rented for $600 a month 30 years ago are renting for $3,000 a month today. The $2k rent you are paying today will be $6K 30 years from now… possibly higher. If you want to retire some day you just have to own your own home. Or invest that money in some low fee stock indexes. The rate of return has been higher historically (even adjusting for inflation). It’s a good idea to buy in areas that offer larger homes for lower prices. The Bay Area has higher end prices, and you get smaller and older built properties for your hard earned income. Price per s.f. is extremely high in those cases. Get more for your dollar, which is usually not so close to the center of Metropolitan Cities. Yep. prices have been going up without any real support, but I think the election is slowing sales at this time. Many homes have been on the market in my area for the last 3 months, when most sold quickly in the first half of the year – just wait until December depending upon who wins!! Question to the Author or any one else who wants to answer . First Thanks for the well written, and researched article. I am thinking about upgrading the size of my home I bought at rock bottom. I do not want to pay capital gains tax on the next house and am already watching my next moves housing market which i predict in 3years. Do are you confident this market will hold till 2019 ? I believe 3 years is the capital gain #? As long as you stay in the house owner/occupied for 2 out of 5 years (does not need to be back to back) you will not pay any capital gains. Very well written and received. Much appreciated… finally, meat and potatoes I can digest. Thank you! Century 21 is taking the approach of herding prospects into a large room and closing the sale before they leave. The postcards they are mass mailing talk about renting / buying and give the impression they are being aggressive about getting loans approved at low interst rates. I totally agree with you, first time home buyers will never be able to afford to buy with this market. Not true. People making 6 figures can afford to buy, they just have to scale down their living. Peoples first home should be a modest home and grow from there. In the 1950s and 1970s people were happy and thinking they were living in luxury in a 1,000 square foot house. I make just under 100k and I am purchasing my sixth single family rental homes in one of the most expensive zip codes in Northern California as rentals in the past 2 years. It’s pretty easy to save and sweat some equity out with the rents. I drive an older car and buy my clothes on eBay, but heck, I have an excellent real estate portfolio and make high rents, because my places are clean and modern. And I spend a lot time working with contractors, accounting and working with my tenants. I am very hands on. My husband makes over $100,000 a year and we are scraping by , maybe because you have rentals but sorry you have to make more then $100,000 to buy a home in CA. We live in San Diego and it’s outrageous. $400,000 gets you a ran down home in bad areas and under 1,000 square foot. im 27yr old. and i make only $2600 a month. and i just bought my house at 2016 July for $225000 1200sqft house build 1970.house in very good condition . put down $20000. and im living in sacramento of CA. i just want to pass a message out…its not that difficult to own a house. u just need to watch your monthly spend, control it tight for 2 years. you will be good. Nicole, I make half of what your husband makes, and I’m sitting in my 4bedroom/2 bath/1304 sq ft house that I purchased in 2009 for $179k. It’s far from a dump, and it’s clearly over 1,000 sq ft.I live in Suisun, in the North Bay, where people live and commute to SF, raising house prices here. Let go of the “woe is me, we make $100k and can’t buy a house because you “have to make more than 100k”. No you do not. You might need to lower your standards or move somewhere else in Ca, because houses in my city are selling for $370, or newer homes in the $400&500k range. I refuse to pay $365k for a home that sold for half that in 2009-2012, but they are out there for sale, and at $1700-1800 a month, including taxes,insurance, p&i, that’s LESS than rent out here. Kelly, I apologize, but you have no idea what you are talking about. You cannot compare your geographic area to that of Nicole. I also live in San Diego, and this is in fact the case here. My 900 sq. ft., 1bedroom/1 bathroom apartment is $2,350/month. When I first started renting here 3 years ago, it was $1,630. I recently got married, and have been searching for a home. The prices are absolutely outrageous here. If you want to live in any decent area, you need to spend $700,000+ for anything remotely nice. My business partner lives in a so-so area. His house is 2 bedroom/2 bathroom, and is around 1,500 sq. ft. He bought it 5 years ago for $400,000. It is now valued at $750,000. Kelly, I live in Suisun City. It’s on it’s way up, back in 2009 I was just starting college and jobs were scarce. It’s going to get ridiculous for us who are just getting our first decent jobs to buy anything. Now the same homes folks purchased in 2009 are selling 400k and up. I certainly cannot move to Sacramento, it would make my daily commute 4 to 6 hours long. We aren’t going to get anywhere either if everyone’s commuting at this rate my commute just gets worse every year as people move further inland. Let’s not forget employers are only giving a $0.50 raise or so each year if that, and that’s to folks with college degrees. In Solano County, Zillow say we should expect housing costs to increase more than the rest of the bay area, I wonder why. That’s how we do it too! It is indeed insane. I saw a tiny condo that sold in 2012 for less than 100K in 2016 priced at 279,000. Yes someone bought it. The realtor said the prices higher are based upon high rents. No one can afford to buy or rent these days. A 2k month apt they are asking for 60k income. It is crazy. Something has to give. The powers that be are realizing that not everyone can even rent an apartment for they are asking you earn too much money, even if you are to rent for 3 months. They are trying to say we are not in a bubble, this is what is scary. Maybe it is simple demand, based upon the out of control immigration to this country….? Immigration is a topic rarely discussed! The only way the state is increasing in population is due to immigration which fuels demand! Awesome points! Awesome points! Immigration has a large factor in population and prices! At this step we return again to 2002-2006 and we will make money again for 5 years and then we will starve the next 5. REALTORS we must stop selling every day more expensive, because buyers are not making more money. I agree with this statement. I’ve watched the market in California my whole life, and it’s definitely due to drop. It’s way over priced, and I really don’t see it going higher. It’s been rising and dropping every 10 years, and we’re right there again from 2008. I’m waiting to purchase, and feel like it would be very risky to purchase now. What about getting a proposition passed banning foreign investors from purchasing residential real estate in California???? Austrailia and Norway are already doing so. Given the limited amount of housing the Bay Area has, I think this would be an excellent solution. Why are we selling the American dream of owning a home to foreign investors!? Would anyone vote for this ban??? I agree, but I just don’t know how much they impact this frenzy…I think it’s more in the tech over valuation. Once the stock cools down, it should bounce back. Absolutely! It would take a LONG time to pass this type of legislation but if people in California push for it, it becomes possible! It’s got my vote anyway. I agree but also disagree. Americans have purchased homes as well outside the US causing this effect in other countries. To me the root of the problem is we do not educate thus employ our own working force; depending on outside workers. One solution might be to add a foreign property tax to this ownership and spend the extra tax on college scholarships. There should be a ban. When the last bubble burst, you heard about foreign investors, esp Chinese buying up just to buy, and the properties would then sit. If feels like we are being taken advantage of… I will just have to vote for the candidate who gets it. Great friggen idea!!!!! Finally someone who gets it! If you truly wish to purchase… there is a way… $2600 a month can buy you a decent home in a decent neighborhood with a realistic attitude. Can you be any more specific about the effect of rising interest rates on prices ‘expected’ in 2016? In other words buying now in 2015 would one expect to be underwater in a few years depending on the change in rates? Thank you for your inquiry! Historically speaking, when mortgage rates rise homebuyers become discouraged and sales volume declines, usually within six months. As sales volume falls back, home prices likewise fall within the following 9-12 months. Therefore, first tuesday expects pricing to decline in 2017. However, to answer your question about underwater homes, prices aren’t expected to fall very far in 2017, nor will they be down for long. Economic action is pointing towards a solid recovery beginning in 2018, and by that point we will likely be heading into our next housing boom, expected to occur in 2019-2021. Therefore, if a home goes underwater due to decreased home prices in 2017, it will likely regain positive equity quickly. Please read more about the anticipated rise in mortgage rates here: Why fixed mortgage rates won’t rise (yet), despite Fed action. You may also read specifics about our forecast for the real estate market here: California real estate almanac: past and future. Are there any granular data regarding shadow inventory? How much percentage are true speculator or flippers, and how much are for parking their money as safe investment comparing to their home country, ie. China? What about the institutional purchase of foreclosure properties? do they rent out those properties, or resell at a later time,? These unknown forces have disrupted California real estate market for the last few years and partially blame for inflating home prices. CoreLogic provides information on the percentage of absentee buyers and real estate owned (REO) properties. CoreLogic also provides data on shadow inventory occasionally. To the best of our knowledge, their latest report is here: A new source of shadow inventory. For information on investors from China, please see our article: Chinese stock market crash motivates investors: true or false? To read more broadly about foreign investors in California’s real estate market, see: The global economy’s effect on local real estate. Does the analysis reflect any concern for the impact the California drought may have on housing activity / home prices over the next several years? What is the world does the author think is happening all over the state. There is only one last chance and that is El Nino this winter. If that doesn’t yield mega results in rain and snow, then all bets are off and so is California because it most likely is in a mega drought. I’ve thought about the drought effect…and I’m torn between two scenarios: One, the state will suffer economically, and eventually have a negative impact on real estate prices. Two, cities will heavily restrict growth because of our severe drought. Scenario 2, to me, is the most likely, and that would DECREASE inventory compared to population growth leading to even higher R/E prices. While it is true that water is a tremendous issue, I see people willing to let their lawns go completely dead and perhaps skip showers to live here in Southern Cal…it’s crazy, and it probably always will be. Then again, there was the collapse of 2008. Who is sage enough to figure this out? from reality I could write a book tearing it apart. Why don’t you people give up forecasting real estate prices ? You have NEVER BEEN RIGHT. NEVER. So what is your forecast ? Thank you for this informative, in depth analysis. This data is very helpful when trying to put current local market data in perspective. Its all about location. Here in the Bay Area, housing sales are out of control once again with multiple offers and homes selling within days of listing. I’d like to see the chart for this area specifically. Of course other (inland) areas suffer massively and will continue until as you said, employment expands greatly and regularly. But there’s magic in the Bay Area and specific smaller locations. Thank you very much for the information on house market trend as well as brokers and real estate agents fall. You list your source as MDA DataQuick. If you will check with DataQuick, you will find they are no longer owned by MDA. It’s always nice to properly reference your sources. It is indeed! Thanks for bringing this change to our attention. We’ll see to it that our attributions are updated accordingly. It seems at this point that the trend was downward but since January things have picked up. When the interest rates were lowered the housing market jumped a bit and since has leveled off just as interest rates have. Thanks for the invaluable lists of important facts that will direct the business decisions of Real Estate Brokers over the coming years. All of your journals are spot-on subjects for surviving this current R. E. Cycle. But this journal gives the lists that a Broker will need when making a business plan. I am studying for my Broker’s Test now.